"Nothing to do with us buddy. 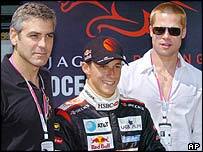 Ask the guy in the hat what happened"
Jaguar were left with red faces when a publicity stunt backfired at Sunday's Monaco Grand Prix. The Formula One team had grabbed the limelight all weekend after being signed up to promote the new Oceans 12 movie. George Clooney, Brad Pitt and Matt Damon, who take part in a Europe-wide jewel heist in the film, all descended on the principality to press the flesh. But Jaguar found themselves at the centre of their own gem mystery when a diamond they were looking after went missing. Christian Klien and Mark Webber's cars were carrying £140,000 diamonds in their nosecones as part of a sponsorship tie-up with Steinmetz. But Klien crashed out of the race on the opening lap when he drove into the barriers at the Loews hairpin, losing his diamond in the process. "Christian lost his steering and hit the barriers forcing him to retire," said a Jaguar statement. "His car returned to the garage minus his flawless diamond - it has yet to be found."